I played little league baseball for two years. I could get on base… if I got hit by a pitch. I usually got to play right field (reserved for the worst players) for an inning or two each game… because everyone on the team had to play. But typically I rode the pine… aka sat the bench. Maybe that’s where I learned to cheer people on in life. But during my first year of playing little league, I remember one hot summer afternoon of practice quite clearly. Coach was teaching us to bunt. That’s where the batter turns his body and the bat to face the pitcher and attempts to deaden the pitch, knocking the ball to the ground a few feet from home plate in order to give a runner from their team who is already on base the opportunity to advance. It’s a sacrificial play because the batter is typically thrown out, but it helps the team. So every player needed to know how to bunt in case that’s what was requested of them during a game. That day, our coach showed us how to stand, how to hold the bat, how to absorb the energy of the ball, and how to direct it with the bat. I must have missed something when he showed us how to hold the bat because, when it was my turn at bat to practice, I turned my body and held the bat between my chest and waist as the pitch came from Coach. Suddenly, pain erupted through my hand. Apparently, you’re supposed to hold your fingers behind the bat and not wrap them around the bat. When the pitch came, it smashed my middle finger between itself and the bat. Oh, I absorbed the energy of the pitch alright. I also screamed out in pain. The collision of ball with finger had resulted in splitting my fingernail in two and producing a significant amount of blood. Coach tried to find water to pour over it to see how bad it was, but couldn’t find any. And so he decided to try to stop the bleeding. All he could find in his Ford Bronco II was a hot, dry, white towel. Yeah, it was like that. We applied pressure till Mom & Dad arrived to pick me up from practice. Sure enough, we got home, got it cleaned up and bandaged, but it hurt like a Dickens. I wanted to look under the bandage at it over the next several days, but Mom told me it needed to stay wrapped up. When I was finally allowed to take the bandage off, something odd happened. One part of the split nail fell off. Over the next couple days, the other part fell off, leaving me with a nail-less finger. It was a weird sensation. And tender… I really had to protect it to keep from reopening the wound. But I learned something important and interesting over the following weeks… fingernails keep growing. That fingernail was not gone forever. After healing up, it began to push new fingernail growth from under the cuticle and eventually returned to full length. That nail still has a ridge down the middle of it where the split happened, but it grows like all the rest of my fingernails. In fact, I sometimes have to cut my fingernails every week or two. That’s because they keep growing. I want to be like a fingernail. I want to keep growing. Sure I may get bitten, cut or even smashed between a bat and ball in life, but I want to keep growing. I don’t want to let anything stop me. We can do that, you know. We can choose to keep growing despite what life brings our way. 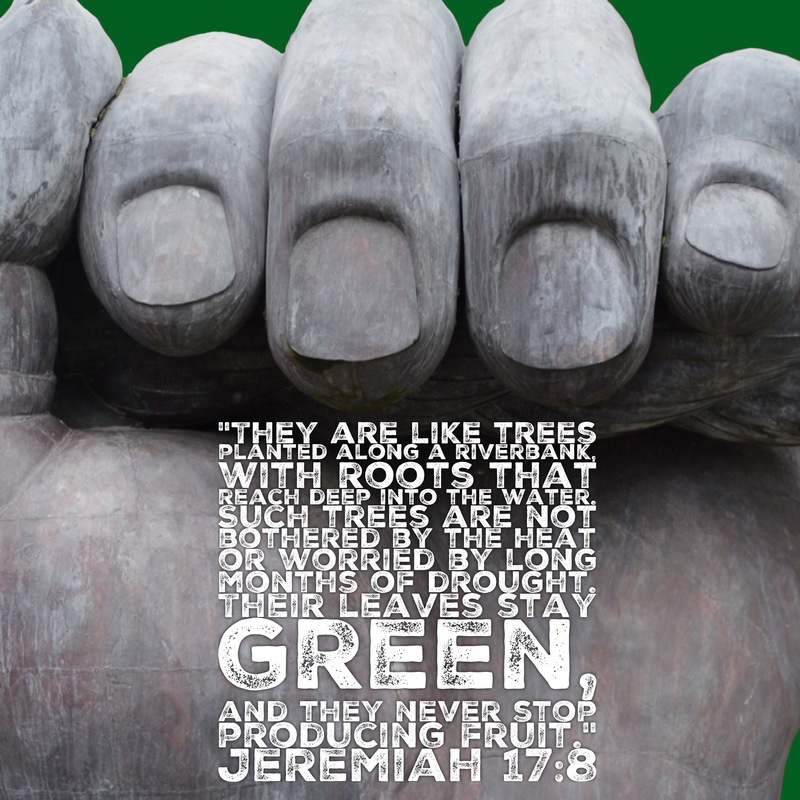 Scripture tells us in Jeremiah 17:8 that we can be like trees which are planted by a riverbank and have roots which run down deep into the water. It goes on to say that trees like this don’t fear extreme heat or lengthy drought, but instead they just keeping on producing fruit all the time. Those kind of people are like fingernails. They just keep growing and doing what they do. And what’s funny is… even though people sometimes try to paint us in their image, coloring us the way they want us to be, we can stay true to who we are underneath. And soon enough, their color will chip off, scrape off or wear off… but we will still be who we were the whole time. They can try to hide us or try to show us off, but we can stay the same underneath. Fingernails are far more useful than we often consider them to be. But trust me, go without one for awhile and you will soon discover how they protect, how they assist in pickup small items and scratch itches. Never let anyone underestimate who you are and what you are capable of. Fingernails re useful little things. So, my call to us today is to be like fingernails… Be strong. Grow always. Stay true to who you are. And realize that you are way more important to those around you than they may even know.